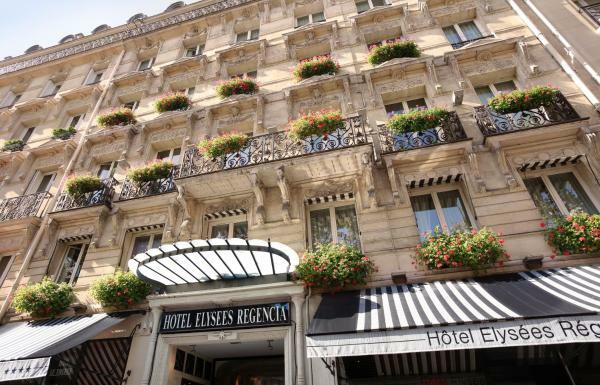 Detailed information about Elysées Régencia on PensionHotel. You will find the hotel description, prices, location, number of beds, available services, attractions. The hotel can be booked directly through the contacts or use the booking form. Before booking see availability Elysées Régencia. 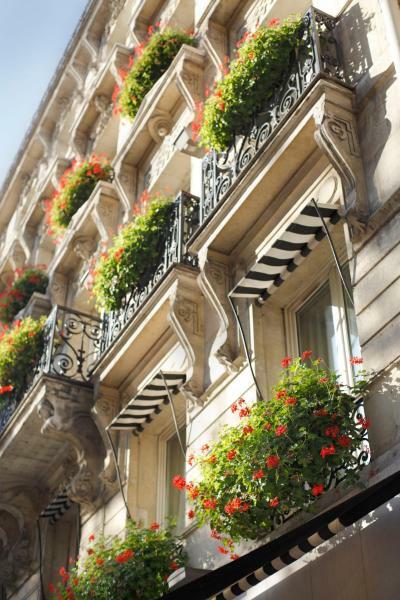 Located in central Paris, this 4-star hotel is 600 metres from the Arc de Triomphe. It offers a reception area, decorated in a designer style with warm colours, a 24-hour reception, a baby grand piano in the entrance and an airport shuttle on request. The soundproofed guest rooms at Elysées Régencia feature a TV with satellite channels and a courtesy tray. Some rooms have a seating area. All rooms include a private bathroom and free WiFi access. An American-style buffet breakfast including fresh fruit juice and organic products (jam, honey and bread) is served every morning in the vaulted dining room. A Chinese breakfast is also available and guests can enjoy a drink in the bar at Elysées Régencia. The hotel has a steam room and a fitness room with a cross-trainer and an exercise bike. The hotel also offers bike and car rental. The property is a 5-minute walk from the Champs-Élysées Avenue. George V Metro Station is 450 metres away and provides direct access to the Tuileries Garden and the Louvre Museum. Private parking is available nearby, upon request. The hotel's steam room is open from 07:00 to 22:00. Guests are required to show a photo identification and credit card upon check-in. Please note that all Special Requests are subject to availability and additional charges may apply. Please inform Elysées Régencia in advance of your expected arrival time. You can use the Special Requests box when booking, or contact the property directly with the contact details provided in your confirmation.